Condell Engineering are developers and manufacturers of truly innovative pipe alignment and fitting solutions, for use in industrial sectors such as pharmaceutical, petrochemical, and gas and water supply. Based in Athy, Co Kildare, the company is owned and operated by Cyril Condell, himself a renowned pipe fitter with a reputation for problem-solving and invention. His experience includes work on major projects such as infrastructure ahead of the London Olympics, the Corrib Gas Pipeline in County Mayo, and InSitu pipelines in South Africa. They already had a website to showcase Cyril’s inventions, but it was not delivering any results for them. They called us in to investigate why – and to make any changes necessary. We performed an audit on the company’s existing website, and quickly established that the problem was that it did not rank highly in Google and other search engines for key search terms related to the pipe fitting industry. While it was number one in Google for ‘Pipe Alignment Trolley’ (the name of the company’s main product), there were virtually no searches for this term, as it was a new term coined by Condell Engineering themselves and not yet in general usage. 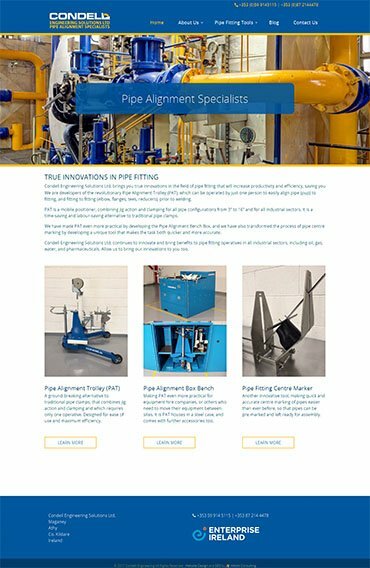 Our market research showed that on the other hand, there are up to 18,000 searches per month for other terms such as ‘pipe fitting tools’ and ‘alternatives to pipe clamps’ – but the existing website did not target these terms. We recommended a complete re-write of text content to include such keywords where appropriate, and a change of back-end SEO strategy to target them too. Condell Engineering agreed – and so we got to work. Our senior copywriter spoke to Cyril to develop a thorough understanding of how his inventions work and the benefits they bring, such as greater productivity and lower manpower costs. He then used this information to craft compelling new copy, with an emphasis on optimum placement and frequency of all keywords agreed, to enable the new-look site to rank highly in Google for them. We also agreed a new page and menu structure, in light of the new SEO strategy, and our web designer then used our new copy and several photos and videos supplied by the client to build a new website according to that plan. Cosmetically, the new site mirrors the old one in terms of colour scheme, fonts used, etc. – but a more strategic placement of images, Call To Action buttons, etc., allied to the improved SEO measures, delivers a site that is more easily found, and more likely to deliver results. Within just days of the new site going live, the client received their first international online inquiries. You can’t say better than that! Visit Condell Engineering to see the results of our work.